There are free SEO tools and then there are those that you pay for, and then, there are overpriced ones. How to choose the right one? Google SEO Tools may be available for you, and we recommend that you pay attention to those first. It’s important to use relevant SEO tools to ensure you optimize your content. In the following text you will get to know al the things you can do using Google’s free tools that will help with SEO. Crawling through your website Google indexes your pages. When Google crawls through your website, they don’t call you up to tell you about the results. 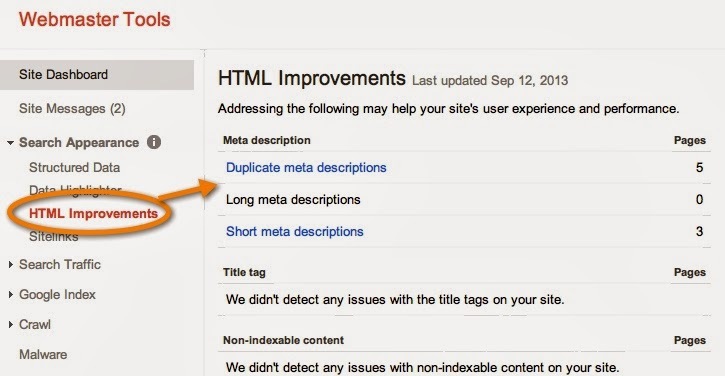 Results are then made available to you in Google Webmaster tools. If there are any errors or problems displayed it’s really important to resolve them. If you don’t resolve them this will effect where your content appears in search results. The image below explains a duplicate meta description, and a brief description. The image also shows that there are no mistakes with title tags. i) Irrelevant keyword for your business. You need to find out why are people using those keywords and finding your website. It is possible that you are using that word too often in your content, or even in your title page. ii) Your click through rate could be too low for some keywords. This may indicate your position in the search results; it is also possible that you have a title or a description that does not make people to click on it. There are also some words that have a high “click through rate”, and some that are very low. In our example ‘google keyword planner’ is the most visible one. The click through rate is listed as 0% because it’s less than 1% (not exactly but close enough). The average position is 8.4 so it’s low down on the first page but I’d still expect a higher click through rate. How to achieve a better click through rate? You can achieve a better click through rate by optimizing your post. In case you did not, e.g. include “Google keyword planner” into the title tag, include it. You can also try to get links from external sites to your content, and move your post up in the search results. You can also improve the site description and make the site content more compelling.